Posted on 08/28/2018 by Mickey McCarter	in Live Review and tagged bluegrass, Earl Scruggs, Earls of Leicester, Foggy Mountain Boys, Jerry Douglas, Lester Flatt, The Birchmere. 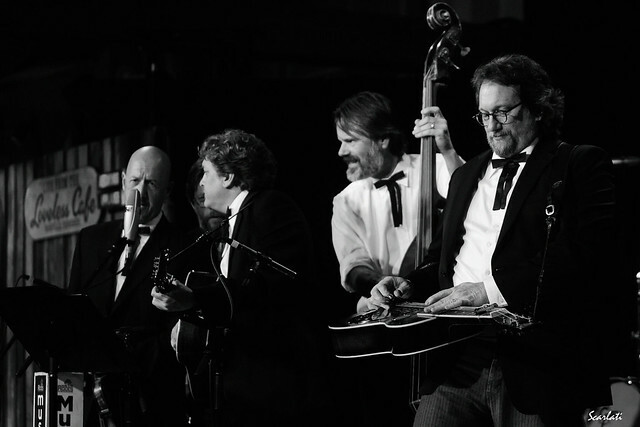 Jerry Douglas formed the Earls of Leicester to present the music of Lester Flatt, Earl Scruggs, and their band the Foggy Mountain Boys to modern audiences. The Earls do some presenting at The Birchmere on Sunday, Sept. 2! The Earls of Leicester and their engineer/mixer, Bil Vorndick, received a Grammy Award in 2014 for Best Bluegrass Album for their self-titled debut album. The Earls followed that album with Rattle & Roar, a second studio record, in 2016 via Rounder Records. Barry Bales (bass, vocals), Shawn Camp (guitar, lead vocals), Charlie Cushman (banjo, guitars), Jerry Douglas (Dobro, vocals), Johnny Warren (fiddle, bass vocals), and Jeff White (mandolin, vocals) also will release a live album, The Earls of Leicester Live at The CMA Theater in The Country Music Hall of Fame, on Sept. 28. The live album comes with a DVD that captures The Earls in concert.